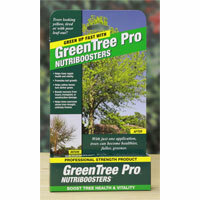 Use Green Tree Pro Nutribooster to keep trees healthy and maintain a dark green color. Green Tree Pro Nutribooster contains 8% iron and 0-15-10 fertilizer. Each kit treats approximately. 15 small, 4" diameter trees, or up to one large, 60" diameter tree. Treat early in the growing season for best results.